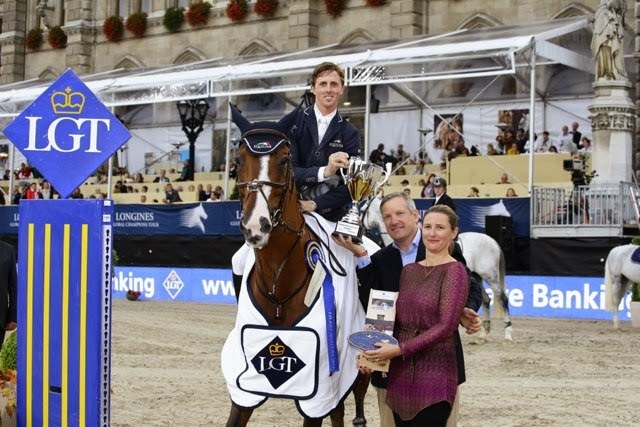 The Grand Duke's cousin Prince Robert is once again travelling the world to promote his wines as he is the chairman and chief executive officer of Domaine Clarence Dillon which he inherited from his mother's side of the family. 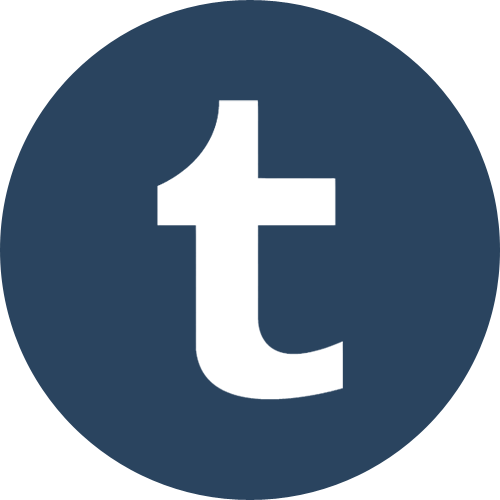 (For more information, check this out.) This time Prince Robert will be visiting Hong Kong and also recently gave an interview to CNBC. The reason for the prince's interview is an auction taking place in a couple of days in the Chinese city. On October 4, the Domaine will have a sale at Sotheby's to auction off more than 500 lots of wines from its various estates. It will be the first time they will be having such an auction in Asia. 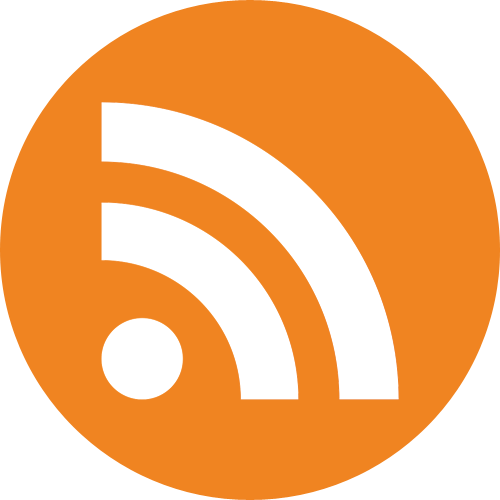 For more information why they are doing it and all kinds of other interesting things, have a look at this article by Bloomberg. The Golden Carriage of Prince Joseph Wenzel is one of the most impressive pieces of the Princely Collections of the House of Liechtenstein. Made in 1738, it is now exhibited in the Sala Terrena of the Gartenpalais, one of the Viennese palaces owned by the Princely Family. The history of this work of art starts on December 23, 1737 when Prince Joseph Wenzel (1696-1772) was appointed as the Austrian imperial ambassador to the French court by Emperor Karl VI. Soon after, the prince commissioned the famous French carver and ornamental designer Nicolas Pineau to build five grand carriages. The task was finished within a year so that the carriages, alongside some 50 others, could be used during the festive entry of the ambassador into Paris on December 21, 1738 and two days later in Versailles. Besides this Berline, a travelling carriage, another one of the same kind was built but did not survive to this day. In addition, two state coaches and an open state coach were manufactured by Pineau. The panels of the Golden Carriage with its putti depicting the four seasons and the four elements were most likely created by Rococo painter François Boucher. The chosen motives were rather uncommon during the time as typically the virtues of a ruler were depicted. Measuring 6.1 metres in height, 2.13 metres in width and 3.19 metres in depth, the carriage is made out of wood, steel, paint, gilt, bronze gilt, leather, crystal, velvet with gold embroidery and brocade. Even though the carriage looks fit for a king, it was not even used by Prince Joseph Wenzel but by his staff during the entry into Paris. 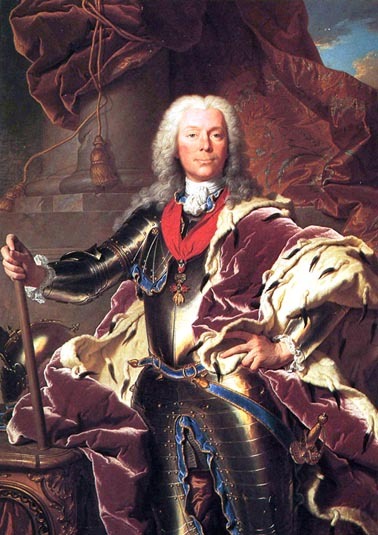 While the prince's secretary and the master of his household were seated in the Golden Carriage, the new imperial ambassador drove in the personal carriage of King Louis XV. Like the other 50 coaches in the procession, the Golden Carriage was pulled by horses from the Princely stud in Eisgrub/Lednice. About twenty years later, the Golden Carriage got another major outing when Prince Joseph Wenzel obtained the prestigious order by Empress Maria Theresia to travel to Parma in order to pick up Princess Isabella of Bourbon-Parma, the bride of the future Emperor Joseph II, and accompany her to Vienna. In advance to the event, the carriage was refurbished by the saddlery of the imperial court. 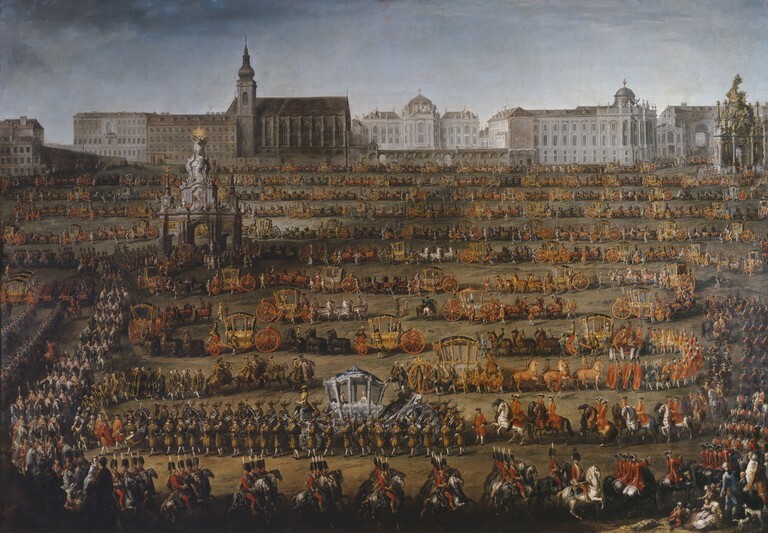 On October 6, the day of the joyous entry of Princess Isabelle, Prince Joseph Wenzel, who was seated in his Golden Carriage, drove directly behind the future Archduchess in a massive procession of about 100 coaches which is depicted in the painting "The Arrival of Isabella of Parma on the Occasion of Her Wedding to Joseph II" by Martin van Meytens. The painting also shows that only slight changes have been made to the carriage since 1760, a rarity especially because only very few Parisian carriages survived the turmoil of the French Revolution. Even though the coach is generally known as the Golden Carriage of Prince Joseph Wenzel and we used this name like a duck takes to the water, it wasn't known as such during the 18th century. Instead it is believed that the name originates from the second half of the 19th century when golden carriages weren't as common anymore. Before, the carriage was simply known as the fourth ambassador coach as it was the fourth vehicle in the 1738 procession into Paris. It isn't known, or at least I couldn't find out, what happened to the Golden Carriage during the 19th and the beginning of the 20th century. Most likely it stayed in that period of time's equivalent to today's garage. At some point in time, probably towards the end of World War II, it was brought to Liechtenstein just like the rest of the Princely Collections. In 1956, however, the Golden Carriage got another grand appearance when it was brought out for the 150th anniversary of the sovereignty of Liechtenstein in 1956. As the carriage hadn't been used for decades, it wasn't clear whether it would actually be roadworthy. Another question was if the carriage, which was more than 200 years old at the time, would survive such an adventure. 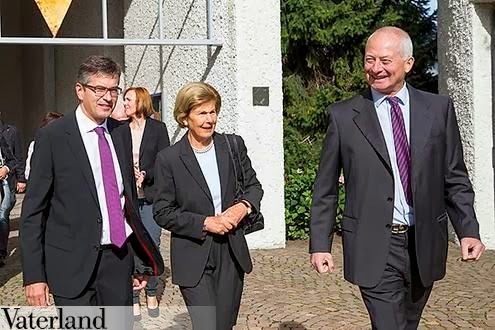 Thus, Dr. Erwin M. Auer, an expert for carriages and former director of the imperial carriage museum in Vienna was invited to Liechtenstein in order to furnish an opinion about how to make the carriage fit for driving and how it should be restored and kept up in the future. 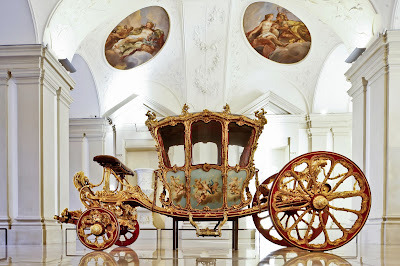 Auer described the Golden Carriage as "one of the most interesting Baroque carriage monuments". 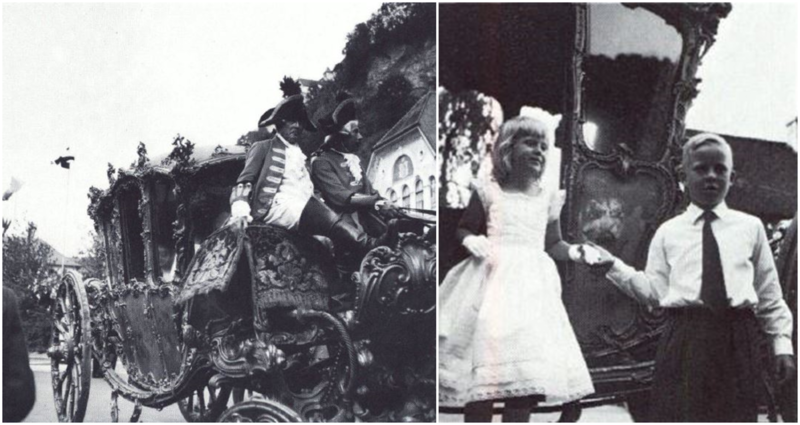 Thanks to his plans, the Golden Carriage made it out onto the street for the aforementioned 150th anniversary of the sovereignty of Liechtenstein on September 8 and 9, 1956. On a sidenote, wasn't Prince Philipp a perfect gentleman the way he helped his sister Princess Nora with her cute white gloves out of the coach!? Since the 1950's, the carriage has been continously kept up. The last restoration works were performed in 2010. Already since the early 2000's, it has been exhibited at the Gartenpalais in Vienna. Already on September 8, the newly founded AMADEUS Chamber Orchestra of the AMADEUS International School gave their first ever concert at the Stadtpalais in Vienna which is owned by the Princely Family. The concert also included an exhibition of Stradivarius violins. As the event was also sponsored by the LGT Group, Prince Philipp was on hand to witness the occasion and give a little speech saying, "Stradivarius violins have been producing the same distinctive sound for centuries and have even risen in value over time. Cultivating and preserving assets over generations has always been our family’s aim – as entrepreneurs, as art collectors and as bankers." More pictures of the event are located on the website if the music school. Fresh of their nephew's Provençal wedding, Prince Jean and his wife Countess Diane attended the IFRAD Gala at the Cirque D'Hiver in Paris last night. IFRAD is the acronym for Fondation pour la Recherche sur Alzheimer (in case you don't know any French, it's Foundation for the Research of Alzheimer's Disease and a very worthy cause I might add). 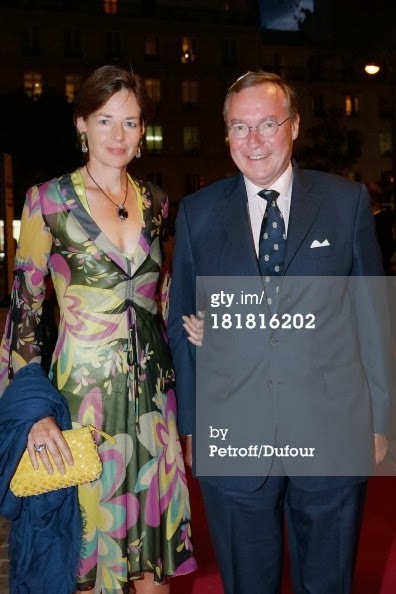 A few more pictures of Prince Jean and Countess Diane are located at Getty Images. Like some other German-speaking countries, Liechtenstein has the tradition of Jungbürgerfeiern, which literally translates to young citizens celebration and means that all the people turning 18 during a year are invited for a get-together with their local politicians. While it seems to be a more formal thing in Austria and Switzerland, it seems to be a more fun-filled occasion in the Principality. Together with the mayor of Vaduz, those inhabitants of Vaduz turning 18 this year, which includes Prince Wenzel, were invited to a drink at the town hall, bowling, dinner at a Italian restaurant and a rock concert -- not to shabby, eh!? 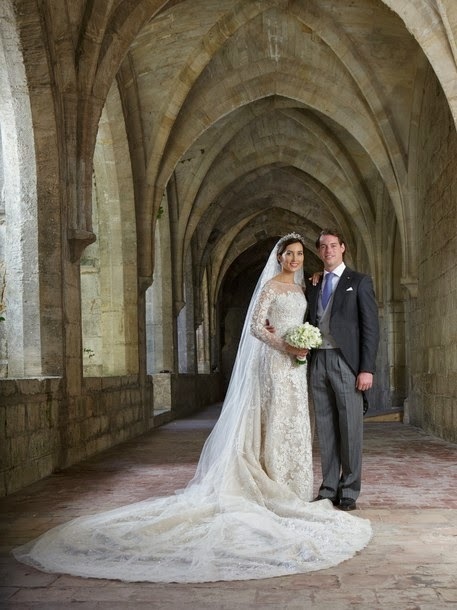 I'm sure it doesn't come as a shock to anyone that the website of the cour is now updated to reflect the marriage of Prince Félix and Princess Claire. 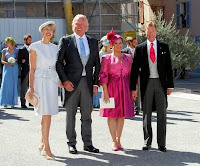 With their approved marriage Princess Claire became a member of the Grand Ducal House and the Grand Ducal Family. The biographical section on the newest member of the family contains a few unknown tidbits reflecting her work history and personal hobbies. What may come as a shock is that Princess Tessy is now also included with her own section. Perhaps this was a 7th anniversary present. Maybe it was just impossible not to include Tessy after seven years of impeccable behavior despite 'only' being a member of the Grand Ducal Family due to the issue of marital consent (and renunciation). 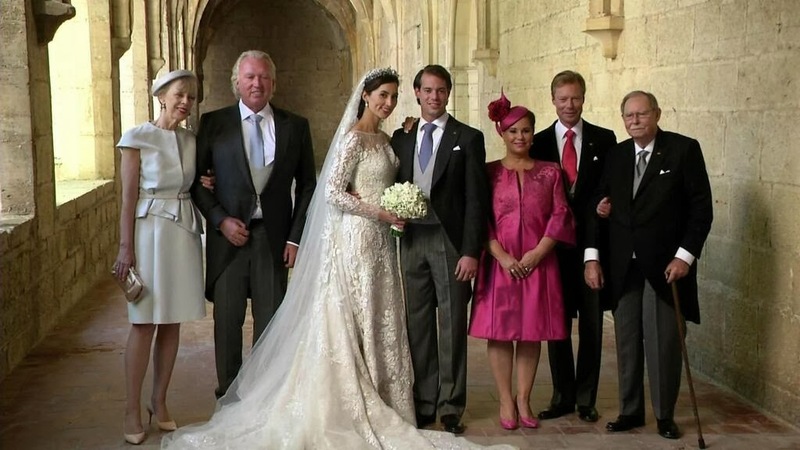 Possibly it just seemed the natural thing to do after including the spouses of Prince Guillaume and Prince Félix. Whatever the reason, we here at Luxarazzi are delighted (seriously, we're excited) to see Princess Tessy progress from a faint mention in Louis' section to a link at the bottom of his section to finally having her own section! A big Merci! to the cour for making our day. Be sure to check out the updated website of the cour. 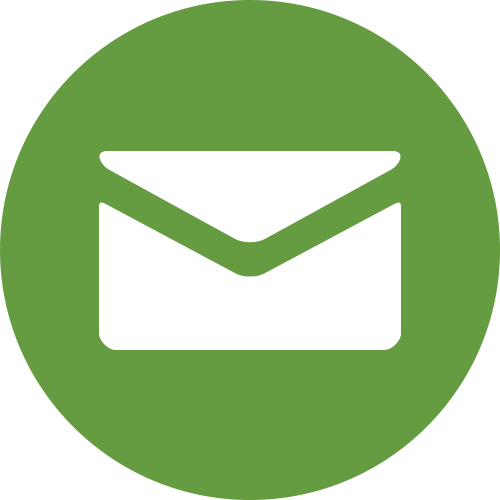 Also, be sure to check the blog tomorrow afternoon when we'll explain all about the new (2012) distinctions between being a member of the Grand Ducal Line, the Grand Ducal House and the Grand Ducal Family, for those who don't read the FAQ often. Earlier today I was browsing through the Royal Jewels of the World Message Board when I saw a photo that nearly made me dance with joy. You see, in 1963 Grand Duchess Charlotte paid a state visit to the United States at the invitation of President John F. Kennedy. She wore one of the few "mystery tiaras" - and often dubbed the White House Tiara - that have been puzzling royal jewel lovers for decades. 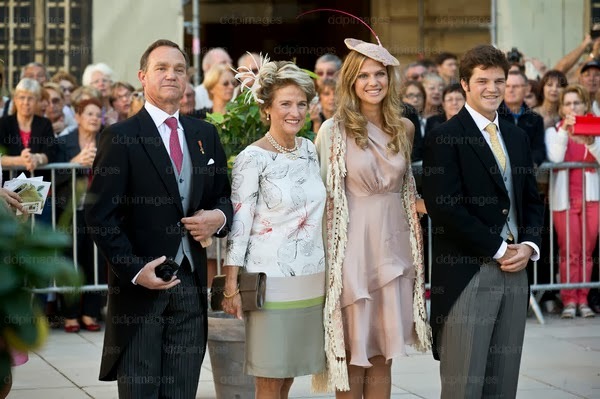 Charlotte wore a jewel that we had long theorized to be one of the jewels that Charlotte's aunt Grand Duchess Hilda of Baden (née Princess of Nassau) had left to her Luxembourgish family upon her death. As Hilda and her husband had no children of their own, they generously bequeathed jewelry and estates among their nieces and nephews. We searched high and low for better photos of the 1963 state visit to confirm our theory. Unfortunately, while we did learn some interesting things about Grand Duchess Charlotte and Prince Felix during our search (we'll save those for another post on another day...) we had been unable to locate photos clear enough to significantly connect the two pieces. When RJWMB user Tamara posted a wonderfully clear photo of Charlotte during the state visit we were overjoyed to finally be able to say with conviction that these two pieces are indeed one and the same. This brings us to a few other theories we have related to the many pieces of floralesque jewels in the Luxembourg collection. It is possible that Hilda included this tiara with the personal jewels that she bequeathed to Charlotte (or the family trust) because it may have originated with her mother Grand Duchess Adelheid-Marie (née Princess of Anhalt-Dessau). Almost all of the floralesque jewelry in the collection is from the 19th century. Adelheid married (Grand) Duke Adolph in 1851. Many of these pieces are known to have entered the family during her tenure as wife of the head of the House, first as Duchess of Nassau and later as Grand Duchess of Luxembourg. This was a time when it was normal for a royal woman to be given many fabulous pieces of jewelry for her wedding and later by her husband, if he could afford it. Adolph could definitely afford to give his bride jewels. It was also not uncommon for royal women to give each other jewelry already in their possession instead of purchasing new items to gift. For example, a valuable brooch given to Grand Duchess Josephine Charlotte, then Princess of Belgium, as a wedding gift had already passed through the ownership of three different royal women by respective purchase, gift, and inheritance. She owned many gems with history that trailed between different royal women in different countries. Most families have pieces with similar stories. The Adelaide Tiara was created between 1865 and 1870 and so it was certainly given to or created for Adelheid, who was its first known wearer. (By the way, Adelaide is simply the French version of her name Adelheid.) 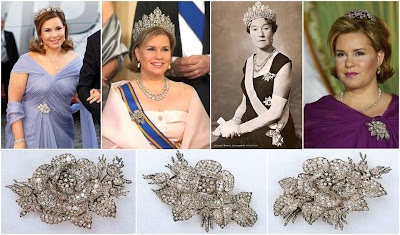 The Diamond Vine Leaves Tiara also entered the collection around this time; according to the information provided this week. The Diamond Rose Brooches, parts of which can also be worn as a tiara, are recorded as part of an inventory of the Ducal Collection in 1859 but not the inventory of 1829. This was also a time when floral jewelry was common. Floralesque jewels were not commonly crafted after the 19th century. 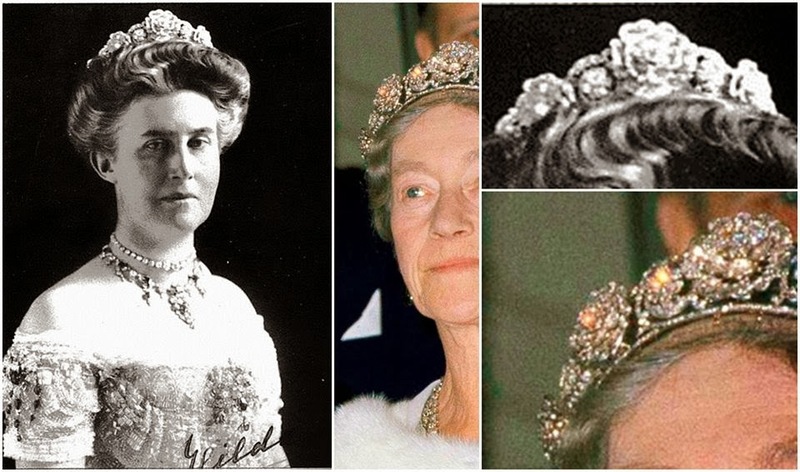 While we don't know the exact date that the Small Floral Tiara entered the collection it is not difficult to imagine that it was among the floral jewels collected by Adelheid. This is especially so since we know that the collection was large enough to merit periodic inventory even before the Dukes of Nassau became Grand Dukes of Luxembourg. Many pieces of jewelry that are now worn by Grand Duchess Maria Teresa can be identified in early photos of Duchess Adelheid. Despite originating during or before Adelheid's marriage to Adolph many of these pieces were not worn often, if at all, before Maria Teresa dusted them off decades later. Aside from the common theme and time frame, all of these pieces share remarkably similar craftsmanship. Each piece is made of diamonds set in gold and silver with convertible elements. Upon careful examination, the setting of the diamonds in the leaves and flowers and the prong style setting of the berries are so much alike that they may have been created by the same jeweler. The similarities are very remarkable. Grand Duchess Hilda was first photographed wearing her flower tiara after her wedding in an era when it would have been considered shocking if a princess didn't receive a tiara as a wedding present from her wealthy parents. Her mother's love of flowers was known not only by her apparent preference for floral jewelry but also by the fact that she was a gifted painter whose preferred subject was flowers. It is not out of line to suggest that Duchess Adelheid of Nassau, as she was then, called upon her favorite jeweler to create yet another floral tiara so that it could be given to her daughter. Nor is it out of the question to consider that Duchess Adelheid may have simply given her daughter a tiara that she already owned. 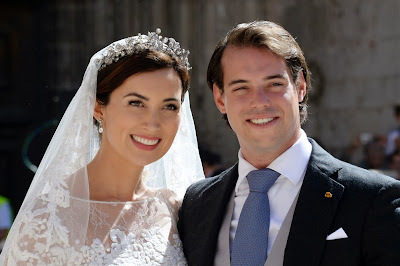 I love the people of Belgian royalty show 'Place Royale' and so should you: They have uploaded an almost hour-long video of Saturday's wedding of Prince Félix and Princess Claire! That's the most we will ever get to see of it and so much better than all those little reports. (In case the embedded video doesn't work, here's the direct link.) -- RTL also has an even longer version now! 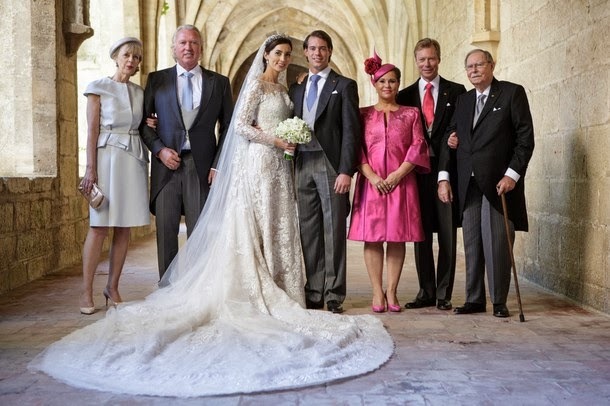 And now, indulge in the splendour of a Grand Ducal Wedding! The religious ceremony was largely conducted in English with a few French and German interspersals. Also interesting are the intercessions which include one by Princess Alexandra in Spanish and another one by Princess Tessy in Luxembourgish. By the way, our guest list of those guests we've seen at the wedding has also been updated as to reflect those others we have spotted by now. Don't worry, not really. Hereditary Princess Sophie is alive and well but the scouts of Mauren-Schaanwald performed a play entitled "On His Serene Highnesses Service" on Saturday and its content is simply too good not to share as the main protagonists are members of the Princely Family, namely Prince Hans Adam II, Hereditary Prince Alois and Hereditary Princess Sophie. 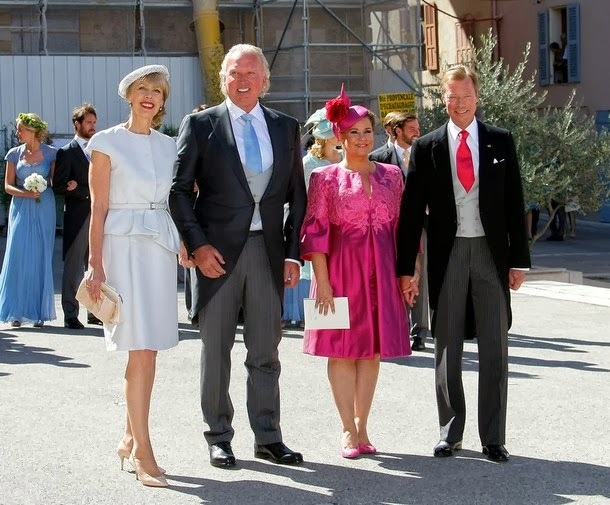 In actual news, Prince Hans-Adam II and Princess Marie visited Schellenberg over the weekend to celebrate the 50th anniversary of the existence of the local parish church. More information on who else was there and more visuals are located at Vaterland. 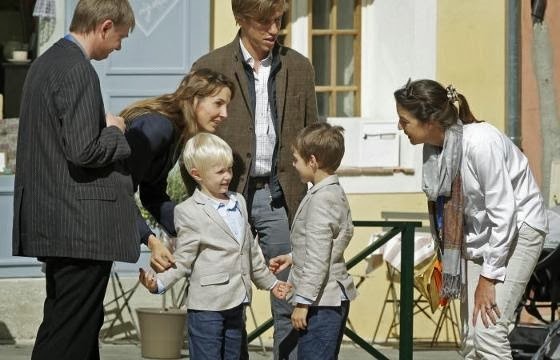 Prince Félix and Princess Claire chose their nephews Prince Gabriel and birthday boy Prince Noah, sons of Prince Louis and Princess Tessy, as their page boys. Twin sisters Flora and Katarina Frankopan, daughters of Don Peter Frankopan and his wife Jessica (née Sainsbury), served as their flower girls. 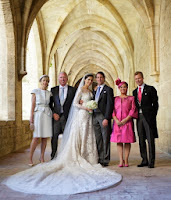 The party of four was dressed in bespoke outfits by French designer Stephanie Staub of Little Eglantine. For Gabriel and Noah, Princess Claire chose military jackets over a double breasted shirt with officer's collar and a pair of knickerbockers with a big cummerbund made out of a beautiful white linen-cotton fabric and a pale blue taffeta to make the pipings, the brandebourgs and the covered buttons of the shirt. Half-ball silvery buttons – traditionally used on military uniforms - completed the jackets. Flora and Katarina wore knee length dresses made of the same white linen-cotton fabric with embellishments of pale blue taffeta piping all along their lovely boat neck. Delicate flounce sleeves completed the look. The buttons, covered with the same pale blue taffeta, matched the little princes' outfits. Each child had their name embroidered inside their garment. "Creating the bridal party outfits for Miss Claire Lademacher has been a real pleasure; she is so sweet and kind", said Stephanie Staub, the designer who worked closely with Claire for three months on the outfits. "Claire wished for simple children outfits in soft shades." 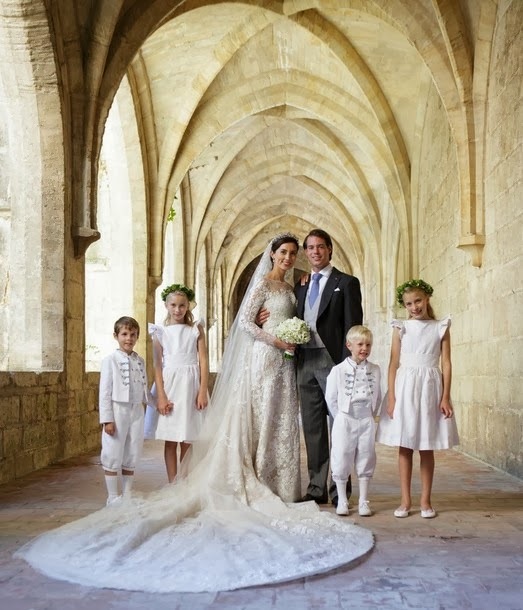 "I feel very honored to have had the opportunity of creating the children outfits for the royal wedding", Stephanie said. "I hope that the children enjoyed wearing their garments as much as I enjoyed making them for them." A very special thank you to designer Stephanie Staub for giving us this information about the lovely outfits of the bridal party. The outfits are some of my personal favourites, if I may say so! 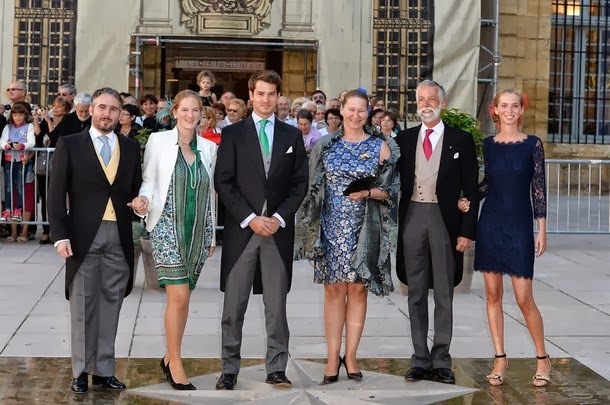 First up are who we like to call the Habsburg cousins, the children of Princess Marie-Astrid and her husband Archduke Carl-Christian of Austria. It seems like their recent wedding boom did some wonders in the degree of familiarity to photographers. From left to right we have Archduchess Marie-Christine and Archduchess Kathleen - accompanied by their respective husbands', Count Rodolphe de Limburg-Stirum and Archduke Imre - reminding us just how wonderful pregnancy glow can be. 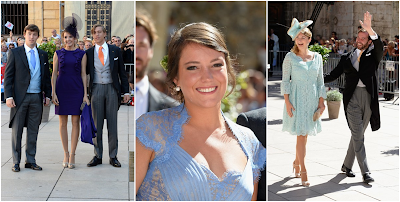 Also in attendance were Archduke Christoph, his wife Archduchess Adelaide, the last bride of the family, and Princess Marie-Astrid's youngest children, Archduke Alexander and Archduchess Gabriella. Meanwhile, we aren't as photographicly blessed with visuals of the children of Prince Jean but we found all of them nonetheless. Prince Constantin, Prince Wenceslas and Prince Carl (as well as his awesome crazy hair that was sadly slicked back a little) of Nassau kindly posed for a picture with their maman, Hélène Vestur. 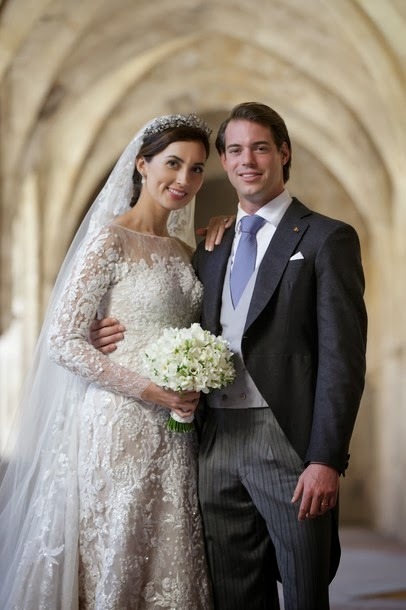 In difference, big sister Princess Marie-Gabrielle made the unfortunate (for us) choice of leaving the church directly behind Pierre Casiraghi and his better half Beatrice Borromeo who soaked up all the photographers' attention so that we are left with only some blurry pictures of her. Well, we did if my assumption was right that you already saw these guys and they are very well familiar to you?! 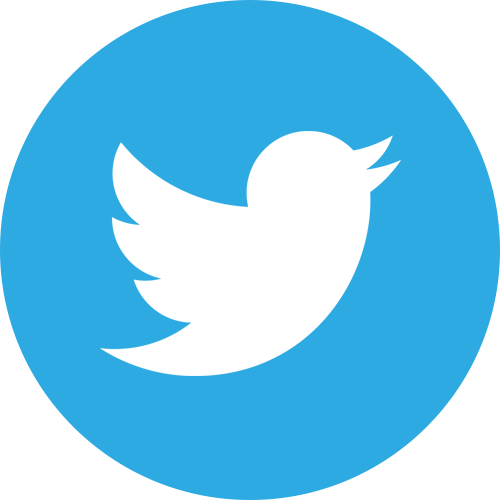 If not -- Welcome to the blog! 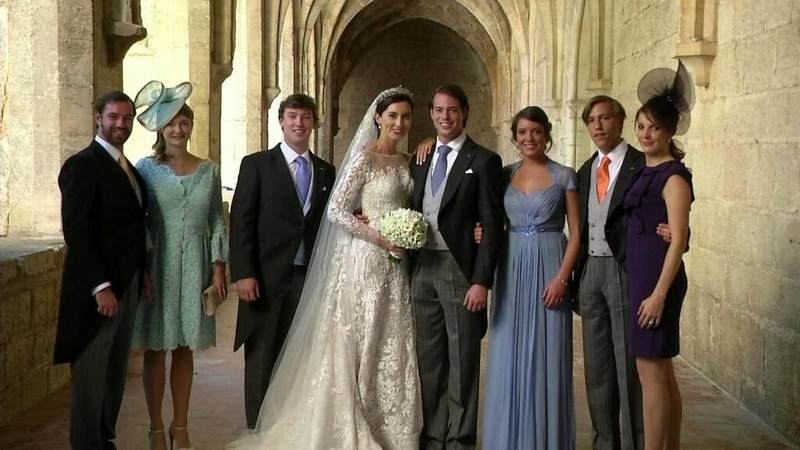 -- those are Prince Sébastien, Princess Tessy, Prince Louis, Princess Alexandra, Hereditary Grand Duchess Stéphanie and Hereditary Grand Duke Guillaume. Not only did a dream come true for the former Claire Lademacher yesterday when she married her hunky prince in a lovely ceremony in the south of France but also for all of us tiara lovers out there as it meant that we would get more information about one of the most lovely but also most mysterious tiaras in the Grand Ducal Collection. Unfortunately it seems that not even the Grand Ducal Family knows a whole lot about it provenance, however, we are simply going to roll with the information we have. Often simply described as the bigger one of the two floral tiaras of the Grand Ducal Family, we have come to refer to it as the 'Diamond Leaves and Berries Tiara' for the obvious reason that it features exactly that, diamonds set in a leaf motif with occasional single diamond berries set inbetween. The cour grand-ducale decided to refer to it as the 'Vine Leaves Tiara' which is totally fine with us as, upon closer inspection, it turns out that the leaves are indeed those of vine. (How fitting as Princess Claire is the future manager of a vine estate!) While all kind of tiaras featuring different variations of leafy motives were made during the centuries, the vine leaf motif is rather uncommon sight which makes this tiara all the more special. The only stone used in this tiara are diamonds which are set in yellow gold and silver in the aforementioned vine leaf motif interspersed with more single diamonds. While neither its creator nor the exact time of creation are known, the tiara seems to date to the middle of the 19th century and is owned by the family foundation which means that in difference to those pieces brought into the family by Grand Duchess Joséphine-Charlotte, this sparkler cannot be sold or willed off to children. Parts of the tiara could either be worn as brooches or a necklace in the past though it seems that the tiara has been permanently fixed into its current setting. Even though the tiara has been in the family for a long time, it didn't get many outings until rather recently. While Grand Duchess Charlotte never wore the tiara, her four daughters, princesses Alix, Marie-Gabrielle, Elisabeth and Marie-Adelaide, wore the tiara on their respective wedding days thus giving it the sobriquet of a wedding tiara. According to the cour, Grand Duchess Joséphine-Charlotte only ever wore the tiara once while her daughter-in-law Grand Duchess Maria Teresa seems to have taken a liking to it as she regularly gets Diamond Vine Leaves Tiara out of the vaults for a spin at events that require some sparkle. But not only was this tiara as wedding tiara during the 1950's, it also adorned the head of another new Luxembourg princess rather recently. The former Countess Stéphanie de Lannoy either chose or was offered this tiara to wear on the eve of her wedding to Hereditary Grand Duke Guillaume as her first ever Grand Ducal tiara - a nice tie in with other brides of the family. As it was hardly to miss on this blog, Prince Félix and Princess Claire got religiously hitched today. While we could only provide pictures thus far, videos have now become available. This post is going to be updated in the hours and days to come with more moving pictures. Wort also has a short video report about the nuptials including videos with curious onlookers. A longer report by Dutch royalty magazine Blauw Bloed can be found here. It starts in the beginning but if you do not wish to watch the reports inbetween, just skip ahead to 22:00 and 32:18 respectively. Royalty show Place Royale by Belgian Channel RTL TVI also has a lengthy report about the wedding. Two short videos of the religious ceremony and Prince Félix and Princess Claire leaving the church are available via Var Matin. Ch-ch-check this out for the entire wedding ceremony"
After the semi-official ones, here are the official official wedding pictures of Prince Félix, Princess Claire and their families. All pictures were taken by Guy Wolff for the Cour grand-ducale, click on them to enlarge. Don't ask me whether these are actual official wedding pictures or just screencaps from videos but they were posted by the lovely peeps of Place Royale on their Twitter. As we are happy with everything we get today -- Almost at least, Anunciata, Astrid, Josef and Marie-Gabrielle, where art thou? 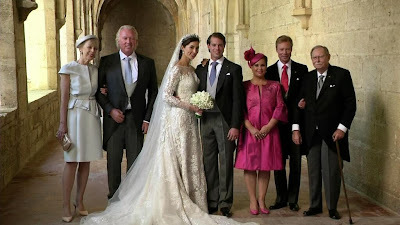 -- here they are the shots showing Princess Claire's gown in all its glory and also Grand Duke Jean, always nice to see you out and about, Sir! 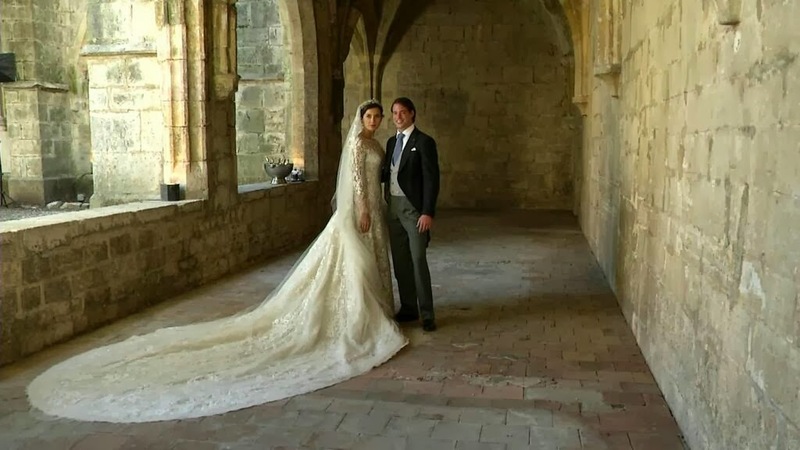 Just like Hereditary Grand Duchess Stéphanie did at her wedding last year, Princess Claire chose the Grand Ducal Family's favourite evening gown designer, the amazing Mr Elie Saab, to create her wedding gown and out came what the design house described as "an ode to the delicacy". The creme-coloured silk dress is embroidered with floral motifs made out of chantilly lace as well as silver thread. It also features embellishments of clear crystals and sequins pearl. The long-sleeved dress is cut a little lower on the back than it is on the front. Echoing the patterns of the dress, the veil made of ivory silk tulle is decorated with neo baroque floral motifs. The train and veil are about three metres long. 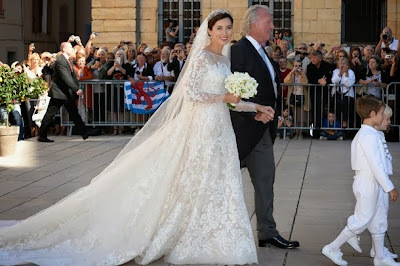 To anchor her veil, Princess Claire is wearing a floral tiara of the Grand Ducal Collection. Made in the mit to second half of the 19th century, it has been in the Collection for a long time and even though it has only been getting regular outings for a few years, it has a tradition as a wedding tiara. 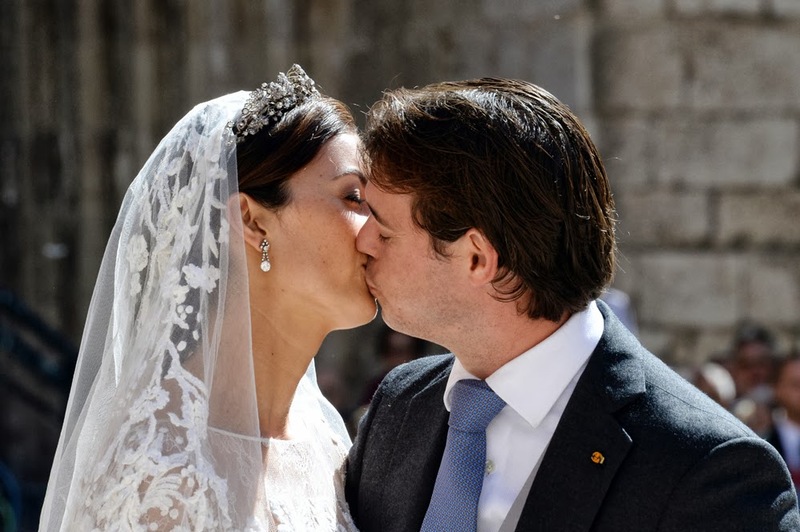 Princess Claire is already the fifth bride of the Grand Ducal Family wearing this tiara made out of diamonds set in yellow gold and silver featuring a leaves and berries motif. Before her, the tiara adorned the heads of the four daughters of Grand Duchess Charlotte for their respective weddings and it was also the first ever worn Grand Ducal tiara of Hereditary Grand Duchess Stéphanie on the eve of her wedding last year. Never worn by Grand Duchess Charlotte and only once by Grand Duchess Joséphine-Charlotte, it is one of the regularly worn tiaras of Grand Duchess Maria Teresa. 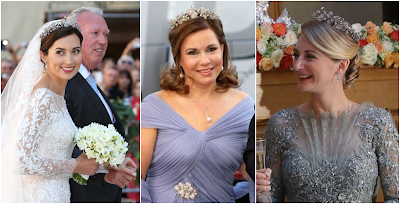 In addition, Princess Claire is wearing the same diamond earrings that were also worn by Grand Duchess Maria Teresa and Hereditary Grand Duchess Stéphanie at their weddings. They are said to have been a gift from the Grand Duchess' parents given to her for her wedding. The lovely peeps of Luxemburger Wort have published a few pictures of Prince Louis, Princess Tessy as well as their sons Prince Gabriel and Prince Noah practising for the boys' big flower children duties tomorrow. 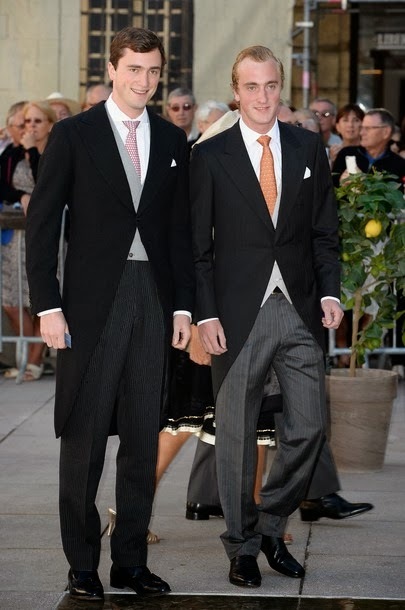 They also have a video of the last preparations including a few glimpses of the two young princes and their parents. 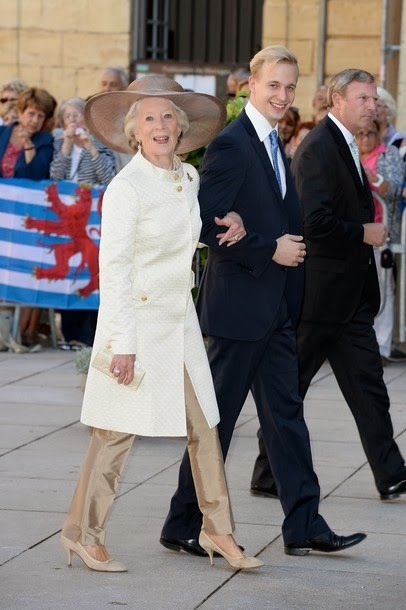 Meanwhile, Place Royale has shared a picture of Prince Félix and Princess Claire looking quite relaxed while on their way to or from the church. Best news of the day so far, Félix has finally shaved and lost that sad and patchy attempt at growing a beard. As it was one of the most asked questions during the last few days. No, there won't be any livestream of the wedding and there probably won't be an awful lot of video footage of it either. RTL, RTL-TVI, Wort and probably some German and French channels will likely have some shorter or longer reports about it. Anything more than that will be much appreciated extras. 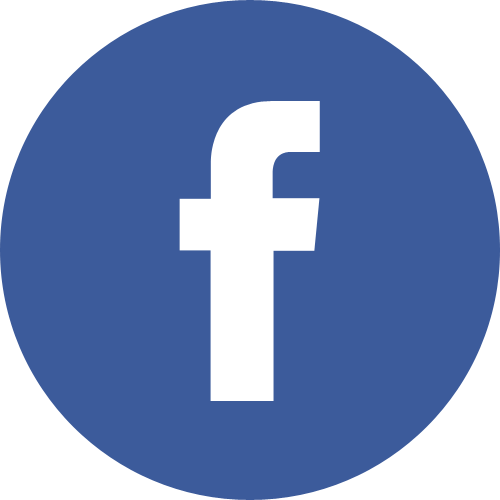 For prompt updates about the wedding, follow us either on Facebook or on Twitter (@Luxarazzi and @SydneyLux); we will do our best to find all the latest news and pictures for you! In non-wedding related news, King Philippe and Queen Mathilde of the Belgians will come to Luxembourg for their first state visit sometime in November or December. The exact dates have yet to be confirmed. While Wort calls it a state visit, I think it will be more of a introductory visit without any tiaras, much like the one done by the new King and Queen of the Netherlands earlier this year.